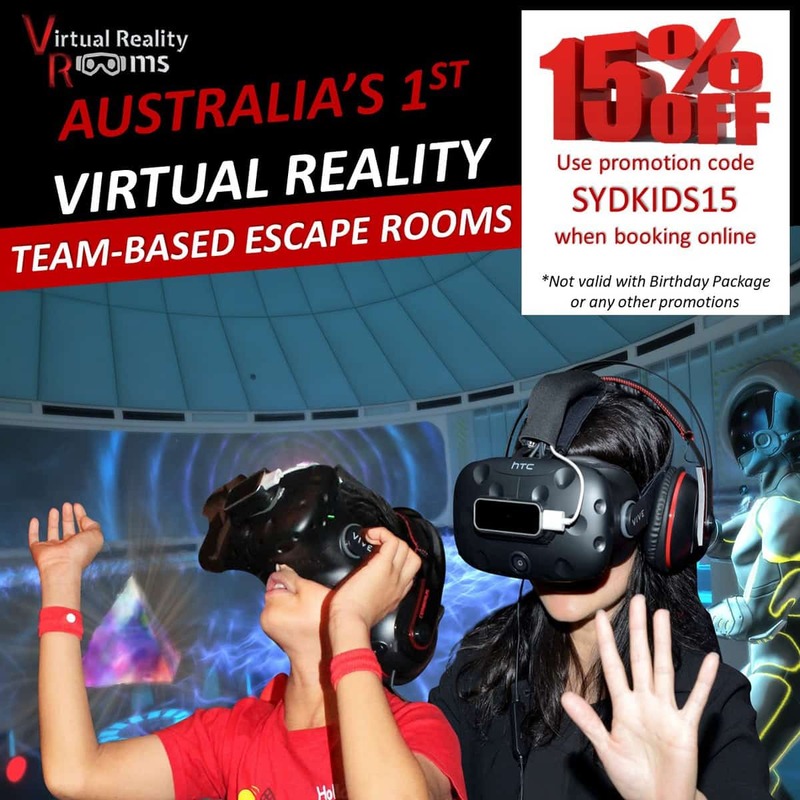 Canberra is a great place to go on a family holiday, but it can get a bit expensive if you are forking out money to go to every single museum and attraction. 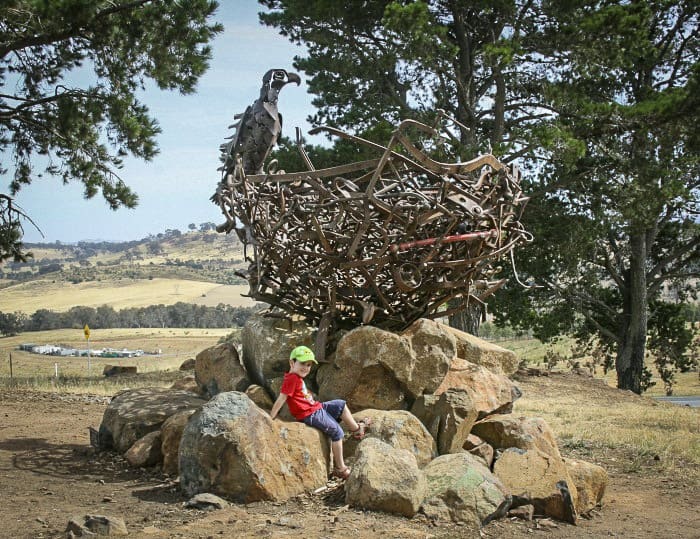 So next time you are visiting the Nation’s Capital, and running low on coin, maybe take the kids to one of these awesome parks in Canberra. And if you need to wear the kids out (and who doesn’t?) 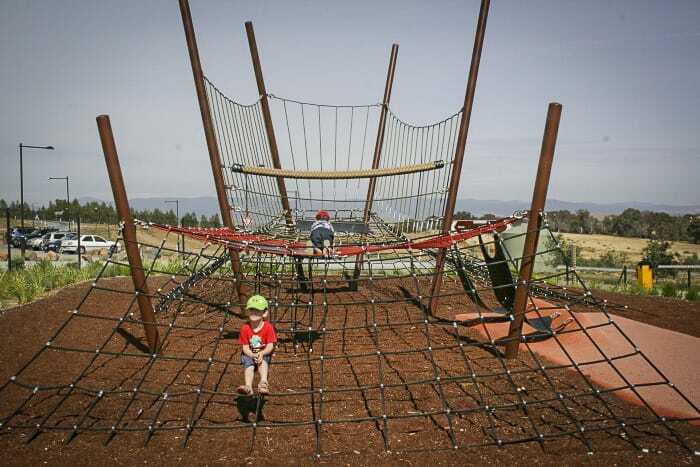 just head off to a playground, Canberra has many excellent ones to explore. 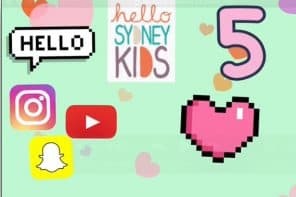 By guest poster Rebecca from the absolutely terrific blog Little Munch, my very favourite blog about eating out with kids in Sydney. PS If you need a place to stay in canberra check out this post on best family friendly Canberra accommodation. The National Arboretum Canberra is a massive botanical garden with a focus on trees. The Arboretum is the most renowned of all the canberra parks and a must visit for enthusiasts. 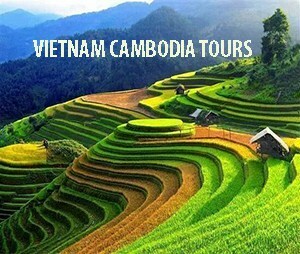 You can visit 94 different types of forest and see lovely sculptures, enjoy the shop and the cafe there too. The Pod Playground is Canberra’s coolest and most unique playground (and probably the most expensive as it cost 3 million bucks to build!). 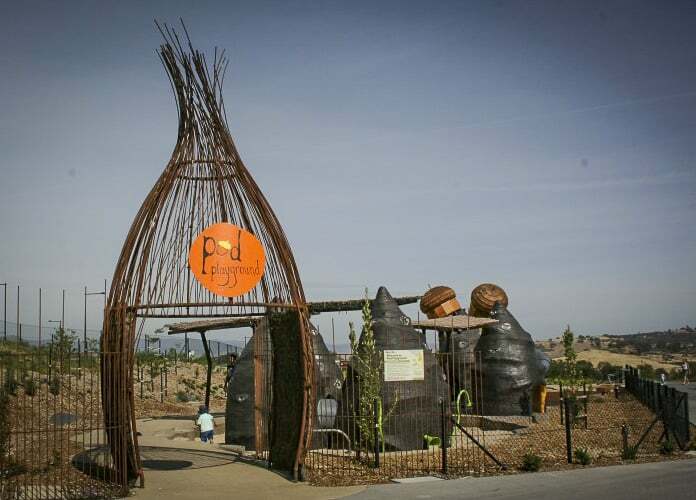 The central feature of the playground is the Pods otherwise known as acorns and banksia huts. 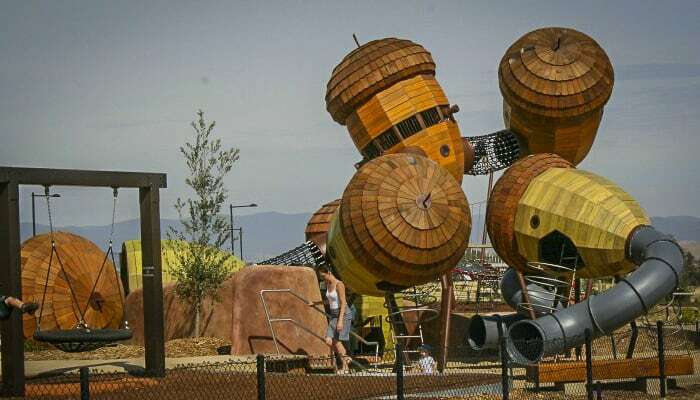 It’s a multi age playground so your big kids can climb through the acorns in the sky, and your little kids can play in the banksia huts on the ground. 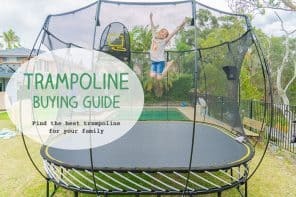 There are rope tunnels and tube slippery slides connecting all of the acorns as well as port holes for kids to see out of – the views over the surrounding Arboretum are spectacular. If your kids get stuck up in one of the acorns, you need to be slim in the hips to get up there and get them down! 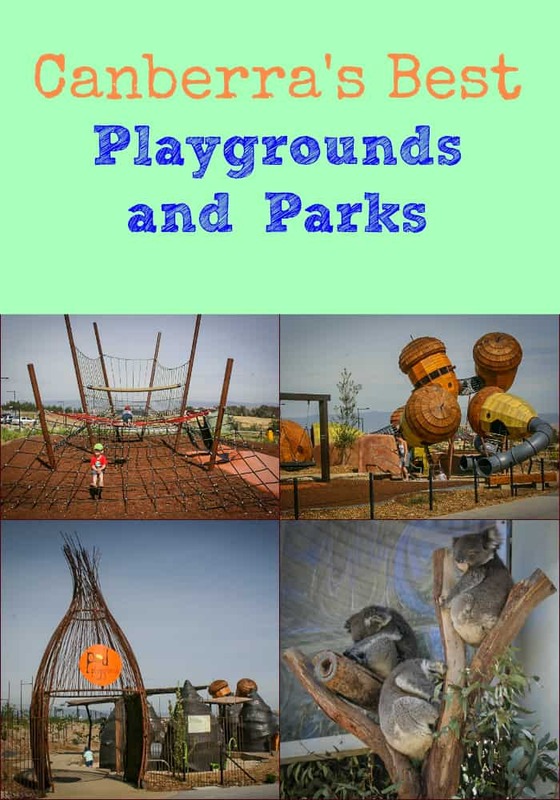 Back down on earth little ones will love playing with the musical instruments in the banksia huts and mucking around in the sand pits as well as crawling and climbing all over the intriguing natural sculptures located throughout the playground. When the kids (and you) have had enough, go for a drive around the Arboretum as it is truly amazing how they have regenerated the area after the shocking bush fires of 2003. 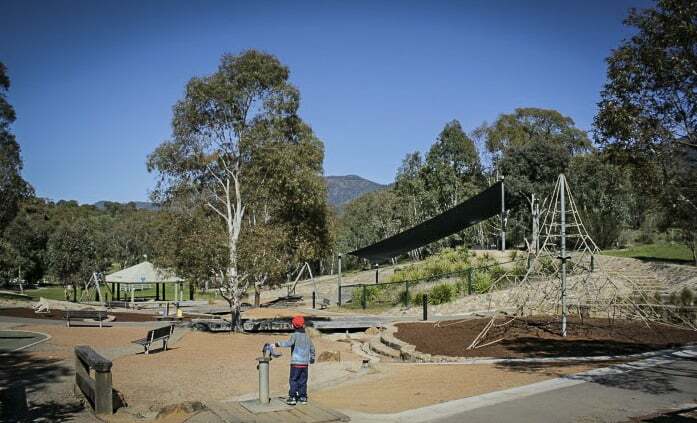 Located near Canberra’s premier shopping and dining precinct Civic, a visit to the beautiful leafy Glebe Park is a good bribery tool to use on your kids so that they behave themselves whilst you are window shopping in the Canberra Centre! 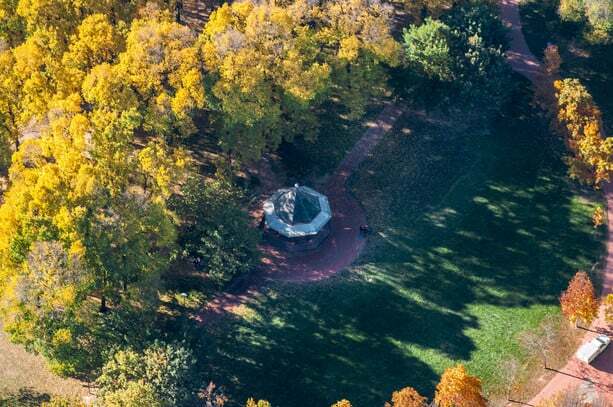 The park contains loads of green space to run around, a rotunda and a very good playground. The playground has swings, slippery slide, a fort and climbing frames. The park is a popular spot for picnics as it is so well shaded. There are ten gates located throughout the park apparently and they are all named after historic places or people. 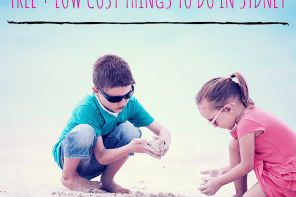 So if you have older kids send them off on a little explore to see who can find them all first. This park is planted to take advantage of Canberra’s seasons and is very pretty at any time of year. If you are looking for central city parks, Canberra has this gorgeous one on offer. This park has been a favourite with families for many years. Located on the water, it has a beach, cycle tracks, picnic shelters, BBQS, toilets, a pretty cool playground and a miniature railway. All of the play equipment is spread out so you don’t feel as though you are too crowded. Our boys spent ages using the mechanical sand diggers, climbing on the rope tower and yelling through the speaker phones. 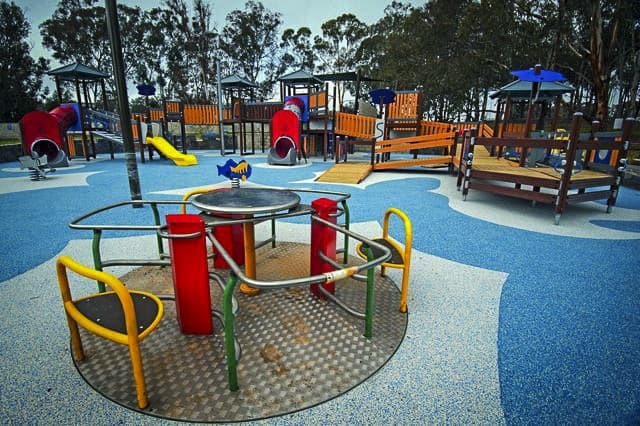 There is play equipment suitable for both big and small kids in this lovely Yarralumla playground. 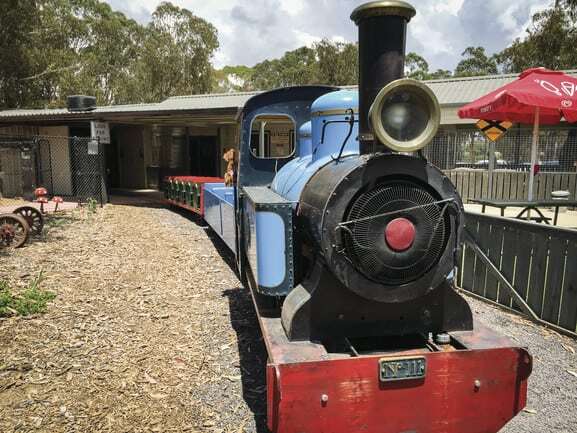 Check out the mini golf, petting zoo, miniature railway and other attractions at Yarralumla Play Station at Weston Park here. Café – yes a kiosk at the Miniature Railway (open on weekends only). 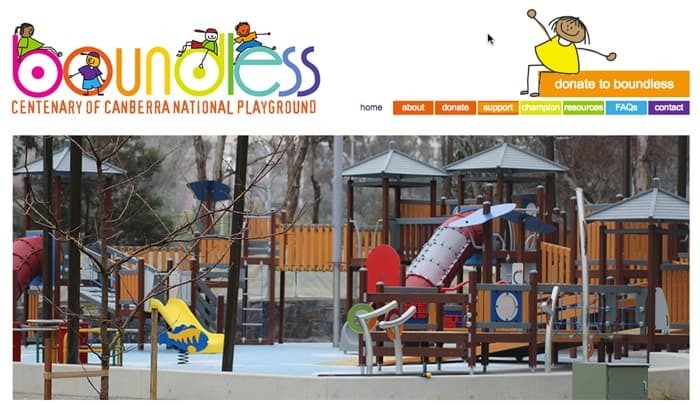 Boundless is Canberra’s first all abilities playground (how spoilt are we in Sydney to have so many!) and it is basically a gift to the people of Canberra to commemorate its centenary. The location couldn’t be more spectacular, right on the foreshore of Lake Burley Griffin. It’s all about the joy of play and it is being touted as Australia’s best all abilities playground. The fully secured playground has a massive fort, a glider, a maze, giant swings and even water cannons. Ramp access, low swings and loads of sensory features are throughout the playground making it inclusive for all ages and abilities. The playground is not far from the National Carillion so you will be able to time how long you have been at the playground by listening to the chiming bells every quarter of an hour! You can enjoy walking or cycling alongside the lake here in Kings Park too, as well as having a play at this top Canberra playground. 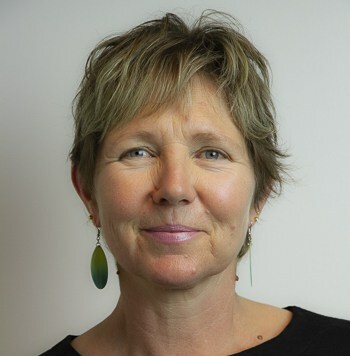 Parking – yes but limited. The best parking is in Russell off Parkes Way – a quick walk across the road. This is our favourite park in Canberra! Well it’s actually not located in Canberra, it’s about a 40 minute drive south of the city centre BUT please do not let that put you off making the journey. Tidbinbilla is without a doubt the best thing we have done on any of our visits to the Nation’s Capital. It’s a 54.5 square kilometre nature reserve where you can see emus, wallabies, platypus, koalas and water birds prancing around right in front of you. The drive down from Canberra is very scenic and you will actually pass another awesome playground at a place called Cotter Dam but I was so intent on the road that we had zoomed past before I realised what a little gem we had missed. 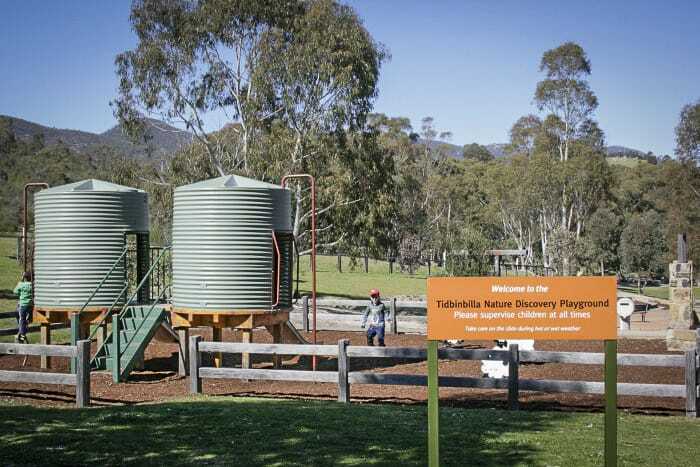 Once you arrive at Tidbinbilla you need to go into the visitors information centre and pay $11.00 – this is money well spent as you can spend a whole day exploring the reserve. After handing over your money you are given a map of the loop road around the area and a ticket which you swipe at the boom gate and off you go on your explore. One of the first things you come across is the Nature Discovery Playground. Park your car and let the kids scamper off. 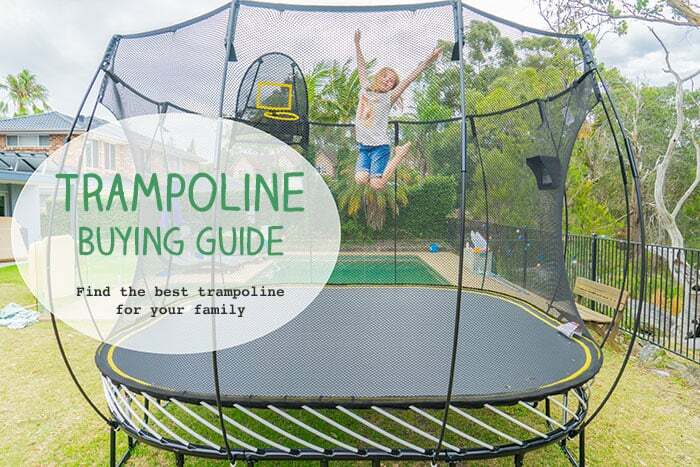 There are climbing frames, slippery slides, a flying fox, loads of space to run around and a cute little pastoral playground where the cubby house has been made out of rain water tanks. Toilets and picnic facilities are located here as well as all over the nature reserve. 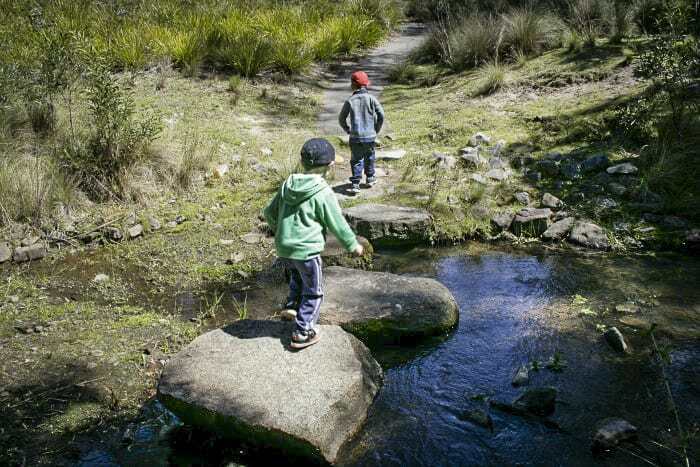 Once you have finished playing, hop back into your car and continue the journey around Tidbinbilla. There are loads of short and long walks you can do from 10 minutes – 8 hours! 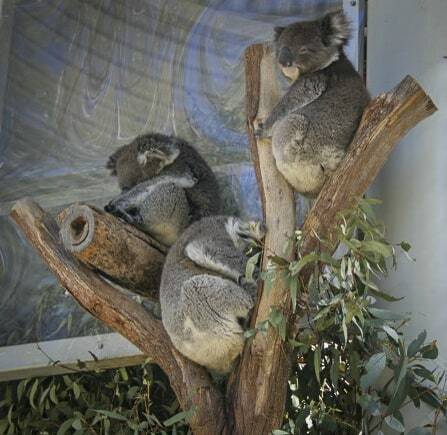 I thoroughly recommend that you do the koala path – because that’s where the koalas are. The other must is the walk around The Sanctuary via the boardwalk. 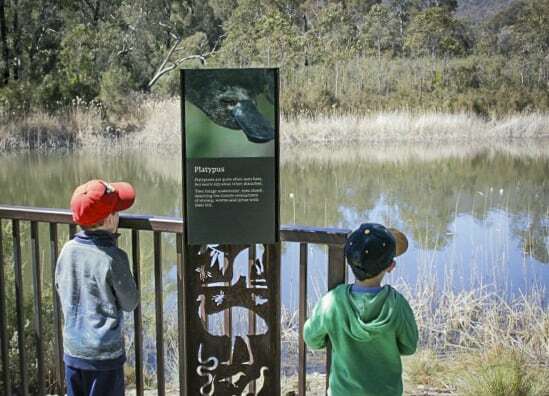 This is not only a very beautiful and peaceful walk (if that is even possible with kids) but you will also see some majestic birds and even the elusive platypus! Once you have finished your loop drive around Tidbinbilla, you end back at the visitor’s centre where you can have a refreshment at the kiosk. There is also an interactive interpretation gallery in the centre where kids can have loads of fun touching, feeling, smelling all things natural! The visitors centre is open from 9.00am – 4.30pm daily in summer and 10.00am – 3.30pm in winter. 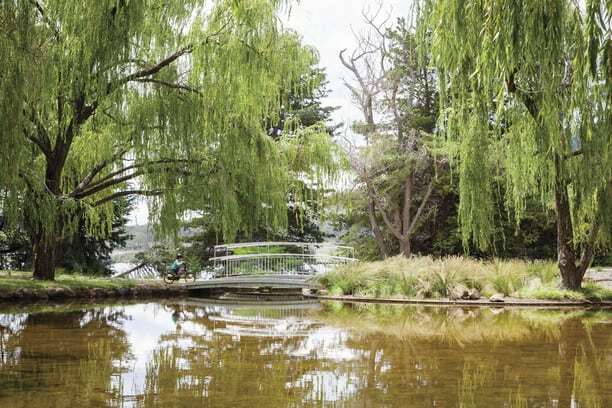 In addition we’ve heard that the ones below are also some of the best parks in Canberra. We haven’t road tested them yet, but will do next time we are running short on coin when we are in the Nation’s Capital. Just to let you know, you can pick up a decent publication that lists all of the suburban parks in Canberra at the Visitors Information Centre on Northbourne Avenue. They actually have their own wee playground located at the end of the Visitors Information Centre and this is a great place to let the kids have a small play whilst you get your bearings and have a flick through the parks magazine. Do pop over to visit Rebecca at Little Munch, it really is a fab blog about eating out with kids in Sydney. Rebecca is on Facebook at Little Munch here. 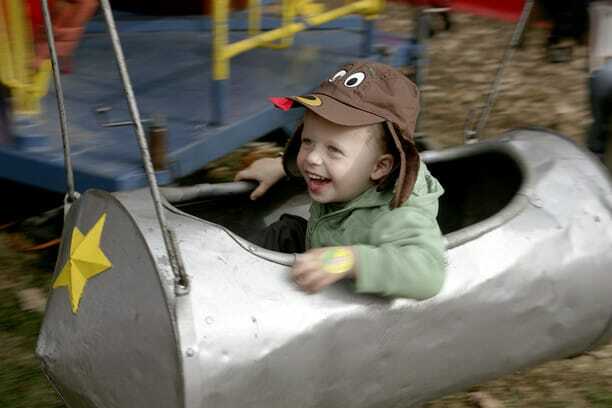 There you go, the pick of top Canberra kids playgrounds and also the best kids parks Canberra. Do you know any other top spots in Canberra?